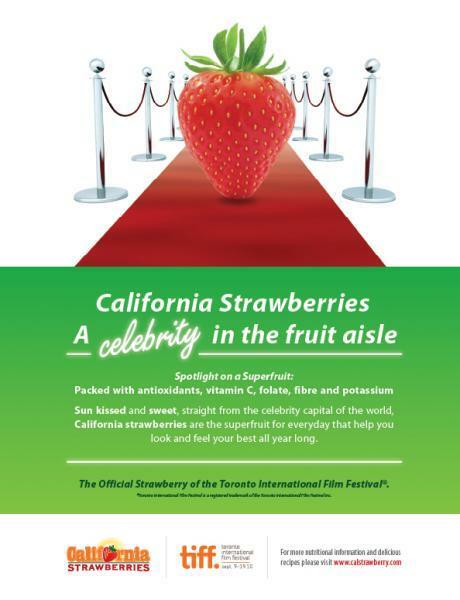 Sun-kissed and sweet, straight from the celebrity capital of the world, California Strawberries are the official strawberry of the Toronto International Film Festival, 2010. This "celebrity berry" will be on the red carpet at the festival, and now you can be there (or at least kind of close to it), too! If you love film, you’ll love the Toronto International Film Festival. And now you (yes, you!) could win two non-gala Screening tickets to the festival. Please send me an email telling me about your favourite strawberry dessert recipe. Entries will be accepted as of now (August 27) until next Friday, September 3 at 5pm (Eastern Standard time). One winner will be chosen randomly. Fresh Strawberry Cake, Strawberry Clafouti, Strawberry Cornmeal Bread and (to die for!) a White Balsamic Custard and Strawberry Tart. These non-gala tickets do not include a red carpet and the recipient must be 18 years or older. Obviously it would be best if you live in Toronto, but if you are willing to travel here to see a movie then by all means, enter the contest!